This book was created at the time of the Centennial and includes historical highlights and historical pictures. It is available at the church office for viewing. The book is rich with history and it almost 100 pages. 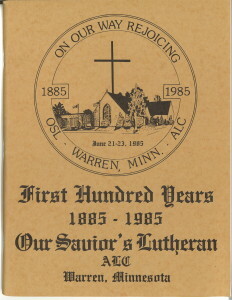 Historical pictures of Pastors, Interns, our church buildings, parsonage homes, and confirmation classes from early years is also recorded in the Narthex (lobby) at Our Savior’s Lutheran Church on large flip panels. This is a wonderful place see and celebrate our history and our present which is history in the making! 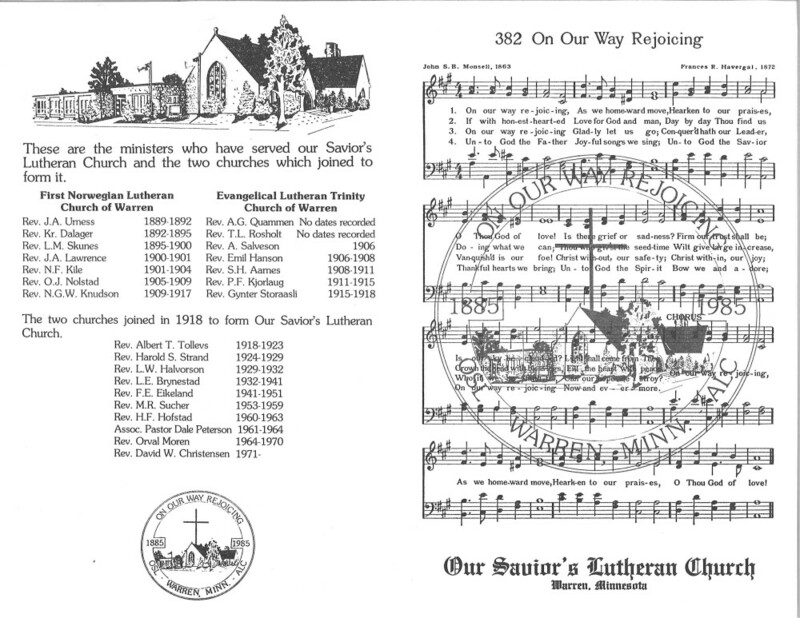 In 1910, a 125th Celebration called “Great is Thy Faithfulness” brought together previous Pastors and staff of Our Savior’s Lutheran Church. There was a nice handout at the celebration that provided excerpts from Annual Reports from 1985-2009. This information can be requested from our parish secretary. Our Savior’s and Melo Churches have a history of taking congregational photographs for their directory every five years. These directories are a historical record of our wonderful members. Looking back through these books in our library is a fun way to reminisce about past relationships and fellowship with our Christian faith and journey together.